LG has posted a teasing video on its YouTube channel to send the rumour mill into overdrive ahead of MWC 2013. Only yesterday, we spotted that LG had posted an image on its Facebook page which simply read: "new series will be unveiled." 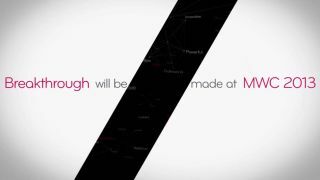 Now the superlative-laden video promises a "breakthrough will be made at MWC 2013" and goes on to highlight words such as "premium", "stylish", "powerful" and "innovative". Surprisingly, LG doesn't actually have a press conference scheduled at the Barcelona event to announce any of these hyped new products. This raises our suspicions slightly and we wonder just how important the devices are, and whether they'll ever become available worldwide. Last year LG had the Optimus 4X HD, Optimus 3D Max and Optimus Vu on its stand and while the 4X HD managed to land globally after an extended delay, the other two handsets didn't enjoy the same worldwide exposure. We spoke to LG about its MWC plans, but the Korean manufacturer was staying tight-lipped on the subject. TechRadar will be out in force at MWC 2013 and we'll be able to bring you all the latest from LG including the new range it's promising.